Lemons and chargrilled vegetables remind me of lazy summer days. This winter has got me longing for BBQ’s, warm days and carefree living with the kids so I decided to hunt out a new recipe to help get me through the last of winter. This salad is absolutely divine and served warm alongside some meat from the bbq, it will be devoured before your eyes. Reheat the leftovers, if there are any, for lunch the next day. 2 red capsicums, chargrilled and shredded, you can use some out of a jar. Heat a large heavy based fry pan over medium-high heat. Add the olive oil and once hot add the pearl couscous and the garlic. Toast the couscous for a minute or so and then add the stock. Bring to a simmer and then turn down the heat and allow it to continue to simmer for 10-15 minutes until water is absorbed and the couscous is al dente. Add tomatoes and half the parsley to the couscous, stir through. Remove from the pan and keep warm. Wipe the pan clean and put back on medium-high heat. Add a little bit of olive oil and cook the zucchini in batches until they have some colour and are cooked through. Remove from the pan and set aside. Wipe the pan again, put it back on the heat and once hot add your halloumi slices. Cook for a minute or two on each side until golden. 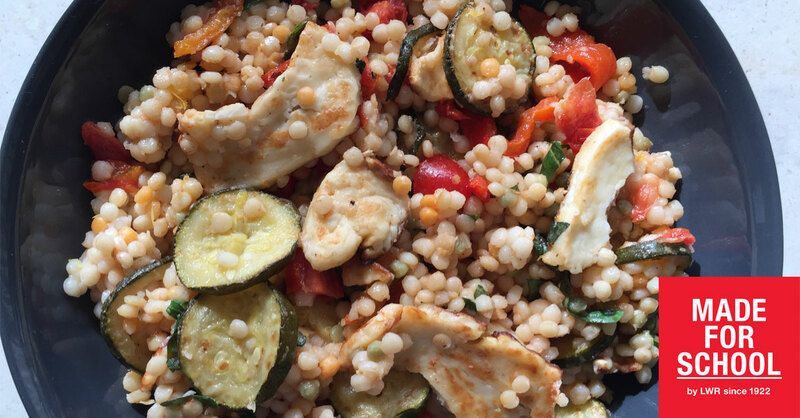 Toss the zucchini and capsicum through the couscous along with the remaining parsley, lemon juice and lemon zest. Season with salt and black pepper then scatter with the halloumi and basil. Drizzle with olive oil and serve in a large bowl.